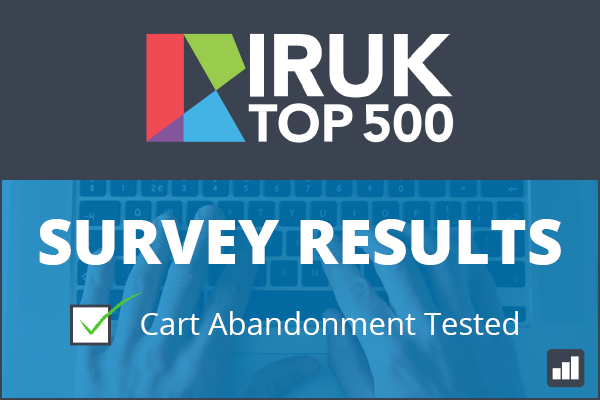 A recent survey conducted by Optilead, specialists in customer engagement, identified that 74 of the 2016 IRUK Top100 failed to follow up cart abandonment – and are at risk of losing significant numbers of sales each year. With retail cart abandonment rates reaching 76%(1) and online retail spend expected to reach £60 billion in the UK during 2016(2) – it will come as a shock to retailers to find that so many companies within the IRUK Top100 seemingly have no system in place to automatically retarget abandonment or engage with potential online customers. Cart abandonment is a much bigger issue than just people dropping off an ecommerce store when browsing. If an online visitor leaves without moving on to the transaction pages, they don’t necessarily have an intention to purchase. But, if they abandon having partially filled in the payment pages, the odds are that something simple – and easy to resolve – stopped them from completing the purchase. They may have been unsure about shipping costs, delivery dates or payment methods – so implementing an automated process to drive customer engagement is critical to complete the sale. Optilead tested the Top100 sites three times each for abandonment. In each case, items were loaded to the cart or basket, details filled out for the visitor and the cart abandoned, prior to completing payment details. This provided retailers with the opportunity to reconnect with these prospects using the contact details entered. During the tests, Optilead’s research team abandoned over £172k of products – an average of £574 for each basket. With goods to these values (significant for the average UK online shopper – predicted to spend £1,311(2) online this year) – prospects are often keen to speak to someone directly to discuss any questions they may have, to give them the confidence to complete their purchase. However, not one company tested took the initiative to follow up the abandonment with a phone call and, more alarmingly, only 2 companies offered the option to request a call back. Staggeringly, only 26 companies actually made any attempt to engage following the tests, and all of these responses were via email. This meant that just over £137k of potential sales were totally ignored by the retailers. In all, Optilead received 56 email responses from the 300 tests. Of the 26 companies who sent these, only half followed up on all 3 occasions. Surprisingly, the average response time to these abandonment tests was 21 hours and 46 minutes. “Having a real-time solution in place is vital to engage with online prospects immediately. But what’s most important for retailers is the ability to harness the tools available to connect with prospects depending on each opportunities value. For instance, high-value leads should be followed up instantly with a phone call, email should be utilised to engage with lower-value leads and SMS is fantastic to touch base, offer discount codes or confirm order and delivery statuses”, he continued. The survey also highlighted that 46% of those retailers that responded to at least one of the tests, failed to do so when higher value abandonment tests were undertaken – which makes no sense to the retailer. Internet retailing: Why is cart recovery so important? Results | How did 48 online retailers react to Cart Abandonment?